Tag Archive | "social media convergence"
Due to the growth of social networking and micro-blogging sites the survival of e-mail marketing has been questioned for quite a few times in the past year.The recent researches by eMarketer and StrongMail once again prove that there is nothing to be afraid for e-mail marketers. The reports also provide some interesting insights about Millennials and how they adapt to the changing media environment and their relationship with social media and e-mail marketing. Marketers sometimes wrongly assume that the new generation is just all about new technologies, tools and channels when targeting digital natives. 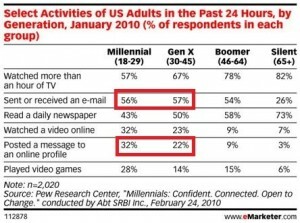 As you can see from the table below, Generation Y is not that different from others, but due to the natural multitasking skill they just embrace more means of communications than the generations before. It actually reminds me about this great talk by the youngest TED speaker Adora Svitak who suggests that every new generation always has to do more in order to keep the progress in pace. 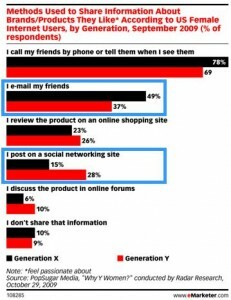 Just 35 % of Millennials use e-mail to share info about the brands. Just 15 % of Generation X use social networking to share info about the brands. 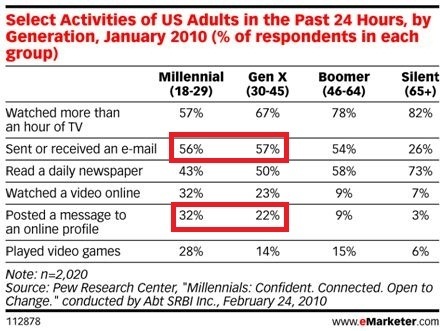 I would stick with the second one (37 % vs. 15 % ) which actually confirms the earlier proposition about Millennials and rises a new issue – possibly the bigger problem is not the “Generation Y” rejecting the old media channels, but the “Generation X” not willing to adapt to the new ones. Therefore, marketers have to think how to make new platforms more accessible for both generations and provide a greater experience by merging them together. According to the StrongMail’s blog post, with the recent announcements from top social brands who are already doing it (Google Buzz) or are set to do it (Facebook e-mail service) creating an integrated social media and e-mail marketing strategy gains even greater importance. Provide a broader platform for advocates. Shift the control to your consumers. 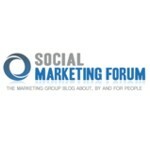 Use e-mail metrics to enhance social ROI. Provide the right form of the content. Before finishing the post I just accidently stumbled upon this video by iJustine, where hundreds of teenagers go crazy at a Justin Bieber concert, screaming and filming themselves all along. It can be noticed, that not only the distribution channel but the nature of the content is vital for Millennials and in the future it’s clearly all about video.